Don’t risk an accident, damaging your safe or incorrectly installing your safe that will jeopardise your security. Transporting safes can be hazardous due their extreme weight if you don’t have the required equipment or follow critical OH&S procedures. 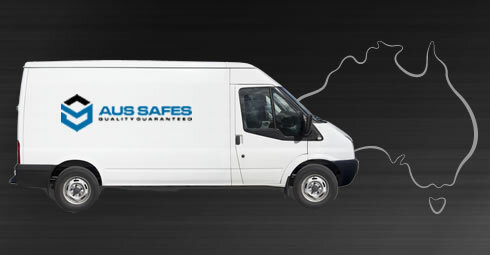 Ensure your safe is professionally delivered and installed by leaving it to the safe experts at Aus Safes. With specialised heavy duty crane fitted trucks Aus Safes can safely deliver and install safes to all locations and site requirements. Our safe technicians work to strict OH&S procedures and can handle any job no matter the size or complexity. Ensure the highest protection by having your safe professionally delivered and installed. Safes should be anchored or cemented into to the floor or wall to prevent removal. Aus Safes can accurately and efficiently install safes into concrete, carpet, timber or tiled floors as well as plastered walls. Aus Safes can manoeuvre and install safes to all locations, whether it be up or down stairs or lifts or requires a crane to hoist the safe through an upper level window or balcony. Our professional safe technicians can ensure a discrete and efficient safe installation every time. Safe is delivered to the site only. It is the receiver’s responsibility to remove the safe off the truck, followed by positioning and installation. The receiver must be aware of the weight and dimensions of the safe to determine if they can lift and manoeuvrer the safe appropriately. Safe is delivered to the outside of a ground level front door only (Not taken up/down any steps). The receiver is to move the safe into the premises, position and install. The receiver must be aware of the weight and dimensions of the safe to determine if they can manoeuvrer the safe appropriately. The purchaser gives authority to leave safe at delivery address. Safes may be picked up from freight delivery depot locations. Check the freight calculator for pick up location/s near your geographic zone. Check the weight and dimensions of the safe to determine if you have the equipment to safely transport and manoeuvrer the safe. Safes may be picked up from the Melbourne based warehouse in West Footscray (15 minutes from Melbourne CBD), depending on the Safe Supplier. Check the weight and dimensions of the safe to determine if you have the equipment to safely transport and manoeuvrer the safe. Use the Freight Calculator located on safe product pages to calculate delivery charges to your geographic location. In many circumstances when a burglary occurs, the offender will do everything possible to remove the safe from the site. Ensure your safe is professionally delivered and installed by leaving it to the safe experts at Aus Safes. Aus Safes can relocate safes from one location to another. We can remove a safe that has been fixed to a site location and re-install it to a new location. We provide all servicing, repairs and can refurbish a safe in conjunction with the relocation. Our safe removals services are prompt and reliable.